Trading With Trends: More Shorting Candidates Than Long: Markets Down? This website contains discussion and analysis of securities trading in NSE, BSE, MCX and NCDEX. All securities are analysed on Technical charts and an effort has been made to predict the future movement of these securities. More Shorting Candidates Than Long: Markets Down? Hello friends, I'm back here after a long long time. To explain my long absence from the blog, I have no reasons to give. Just lazy, I guess. What brings me here is a wonderful program that I attended in Bangkok in May 2016. The 5th edition of the Traders Carnival, a program in which traders from all over the world got together and shared their ideas on how we could generate profits from the markets. The program really has helped me broaden my vision about trading with a system and it once again reaffirmed the importance of discipline in trading. Despite understanding once again that systematic trading is more profitable than discretionary trading, trading still remains a game, and a game which should be played when the odds are in your favour. Fundamental analysis, technical analysis, analyzing results and looking at charts are ways in which you could bring the odds in your favour. This weekend I did just that. First of all, like always, let us have a look at the broader market, ie the Nifty. Nifty has been correcting ever since it has touched its high of around 9100 in early March 2015. It has been over an year and the Nifty had even gone down to 6800 levels during the correction phase in Feb 2016. However, since testing the 6800 levels it is continuously going up and is currently trading near the 8220 levels. 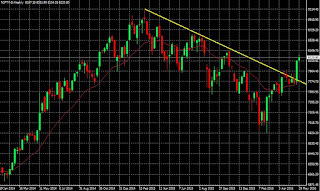 The rise of 25th and 26th of May gave a clear signal that Nifty had not only broken an year long trendline on the weekly charts but also confirmed an inverted head and shoulders pattern on the daily charts. This is clearly bullish for the markets. 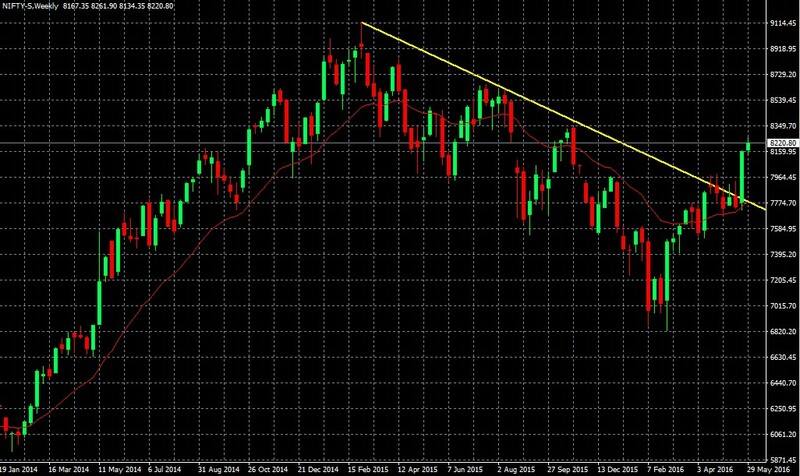 Attached above is the weekly chart of the Nifty and it indicates that the one year long trendline which commenced from the 9100 levels and which has successfully tested three times was broken through on the fourth attempt after a vigorous tug of war between the bulls and the bears. The bulls had the final say and the markets decided to side with the bulls this time. This trendline breakout in the Nifty on the weekly charts gives us a target of between 8800 to 9000 in the weeks to come, I don't mean to say that it will go there unidirectionally. The head and shoulder is not visible quite clearly here but it will become clearer in the daily chart of the Nifty shown below. The daily chart of the Nifty also indicates almost identical sentiments and clearly shows a breakthrough of the neckline formed by the inverse head and shoulders pattern, of which the two shoulders and the head have been marked clearly. 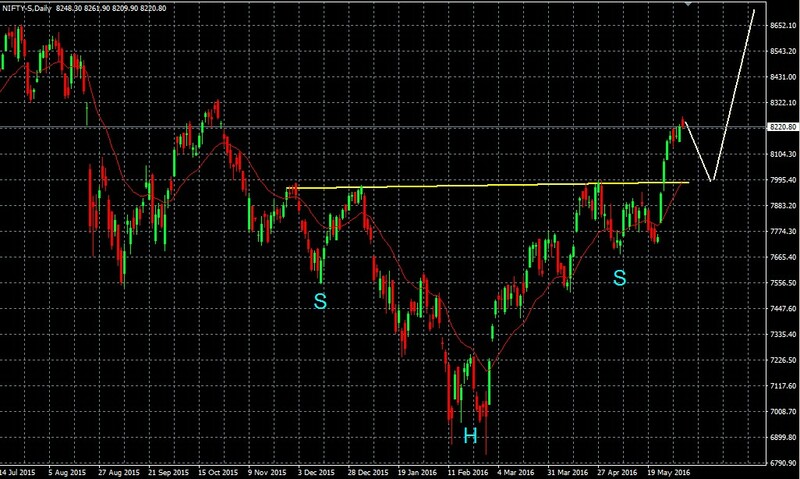 A rough estimate of the target of the H&S pattern is around 8980. So, almost identical levels too. Again not to say that it will go there unidirectionally. The white lines on the chart could just be a possible path that Nifty can take on the way up. 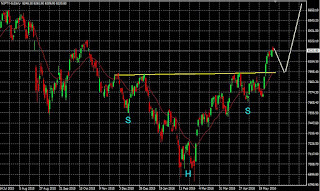 Which means that a pullback to the neckline or a correction to 7950-8000 levels cannot be ruled out. I also had a look at various F&O charts this weekend and found that there were more shorting candidates than long ones, which might just suggest that Nifty may have peaked out in the short term and may undergo a correction in the days to come. Well, what happens, that only time will tell but if I were to put my money on Nifty, I would classify the trend as short term down, medium term up. If I am holding any long positions, I may consider 8130 as my stop loss level in the Nifty. The following table shows you some of the long and short candidates that I would consider in the coming week along with their stop loss and target levels. If you like the analysis here, you can subscribe to the posts feed or you can follow me on twitter, add to circles on google plus or connect with us on facebook. DISCLAIMER: These are my personal opinions and in no way should they be misconstrued as calls or recommendations to buy or sell. The author holds no share and no responsibility for any profits/losses generated by the reader upon trading on the stocks mentioned by the author. The stocks recommended above are those which are looking good in the near to long term based on Technical Analysis. The reader should do her own research before investing in these stocks or take the advice of her financial planner. Any action the reader chooses to take in the markets is at her own risk. The author will not be liable for any, direct or indirect, consequential or incidental damages or loss arising out of the use of this information. The information published on this page is only for academic purposes and should not be treated as an offer or advice to buy or sell any of the securities mentioned herein. It is safe to assume that the author or his clients may have a position in the securities mentioned above.